Nice quality, well padded, room for all your bits and pieces. The NHP comes with the new nobile fulcrum - a moulded pastic chicken loop which completely detaches from your bar when the safety is deployed, hence eliminating the chance of any possible tangles or catches on disconnection. The system seems to work well, but if you arent using the chicken loop finger you can face losing your chicken loop if you arent suicide leashed to it (this isn't a problem as it has a good deal of depower). A nice looking kite, which does look somewhat small for a 10m, its very well reinforced along the leading and trailing edge, and comes with a single pump inflation system, which is just a dream when you're used to pumping up all the struts individually. The kite connections are cleverly done so that the front and real lines cannot be connected incorrectly, the front lines on the kite end in larks heads, whereas the rear lines end in knots - these are matched with the opposite conections on the lines. There are a few choices on attachment points on the kite, but no mention of which is for what, and nothing in the manual. I sent an email off to support about this, and was amased to get a reply from Mark Shinn himself - to which he replied "With the attachment points I would advise you not to change anything. There is no mention as it turns out to be far to complicated to advise on their use and it is too easy to mess up the kite trim." The kite seems to need a fair bit of wind to you going, but once it does so, the ride is thrilling. The pull isn't a gradual acceleration like you get on the waroos, but a real solid pull from the harness which can really be felt in your back. The kite copes with the gusts extremely well, looks rock solid in the sky, and depowers well when you edge against it (which is all new for me, as i've been flying bows for the last few years). I'm still a bit tentative with it, but managed some decent jumps, but the one thing which really stands out is kitelooping. The kite loops really fast generating loads of oompf, but because its gone around quick you're still left with a decent amount of time to get your board right before hitting the water. Depower seemed good, but you can definately tell it isn't a bow kite, but its nice to have the security of knowing there's a 5th line attachment, should you need to get the kite down with nobody around to help. I didn't have the kite down in the water much, so didn't get much chance to see what it was like for relaunch, but the times I did, the 5th line got it efficiently on its back, and the standard SLE technique of pulling on the top line got it to the edge of the window/clear of the water pretty fast. 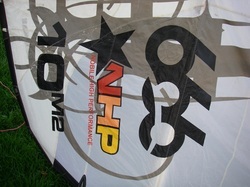 A very nice kite, but my opinions may differ quite a lot from a C kite veteran. Its all pretty unfamiliar territory to me, and will take quite a bit of getting used to. I haven't yet reached the point where I'm more comfortable with it than I am with the waroos. I'll maybe post some more info after I've gotten used to it a bit more.